The backdrop to this picture is of the Old Doric, a stone work structure guarding the entrance to the town. 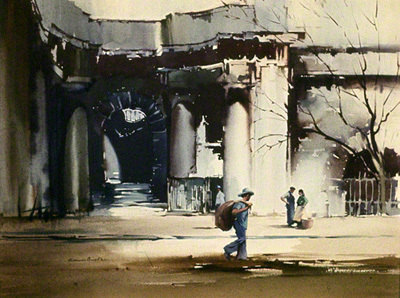 Claude Buckle in his water colour shows off his technique for painting buildings as a backdrop to an interesting set of characters shown in the foreground. Created in 1971.